2000 Booklet on Diet and Premenstrual syndrome sold on behalf of the PMS charity, NAPS plus distributed to chemists. 1999: Co-author in an update of ‘Peanut Allergy: Information for Dietitians’. 1998: Forward written for ‘The PMS diet book’ by Karen Evenett. Gaynor Bussell has been a dietitian for over 30 years and has specialised in women’s health for most of that time. 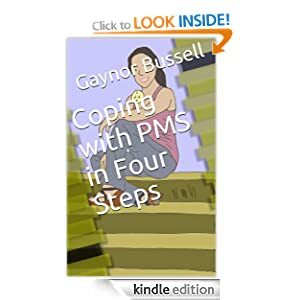 In her Amazon Kindle e-book, she offers advice in the form of four simple steps that will help women cope with the monthly cycle of PMS. The information will appeal to PMS sufferers or anyone with an interest in the subject (including healthcare professionals who deal with patients with the condition). The e-book includes the latest research-based evidence on how diet and lifestyle can impact on both mild and severe PMS symptoms. There is advice on eating a balanced diet, choosing low glycaemic index foods, using supplements and controlling stress and chronic conditions with weight loss and physical activity.